If you received an acceptance email from us you can go ahead and pay the registration fee. We then highly encourage to book a hotel room as these quickly taken. Aspen physics center has a contract with Aspen Meadows, although there are other options available in town for the participants. Click here to learn more about costs, travel, etc. We encourage both shared rooms and early bookings. Make reservations far in advance, since winter weekend travel to Aspen is popular. Flights into Aspen (ASE) are easiest, but can be expensive or sold out. Flying into Denver (DEN) or Eagle is also an option. More information is available here . Flying from Denver to Aspen takes about 35 minutes and is served by United Express, 1-800-241-6522 and American Airlines 1-800-433-7300. There are also direct flights to Aspen on United Airlines (Chicago, Los Angeles, San Francisco, and Houston) and American Airlines (Los Angeles, Dallas). You may also choose to fly into Eagle-Vail, Colorado, which is 80 minutes by car from Aspen. Ground transportation is available from both Denver (5 hours) and Eagle (1.5 hours) through Colorado Mountain Express: 1-800-525-6363, Fax #: 970-949-5032. Reservations are required. To get the discounted rate, mention that you are with the PHYSICS Group. You can also arrange to rent a car or get a ride with another participant. Sign up on our RideBoard on our home page. The login password is in the email to invited participants. You need to be on the January calendar page. Below the calendar is an Add/Edit button you use to enter your informaton. Keep it short, include time of travel and your email address. If you are driving from Denver, please note that INDEPENDENCE PASS IS CLOSED DURING THE WINTER! Take I-70 to Glenwood Springs and then Highway 82 to Aspen. If you arrive by air, you may call the Aspen Meadows from the airport at 970-925-4240 for complimentary shuttle service. If you are staying at the St. Regis, call: 970-920-3300. Cars are not needed in Aspen, but if you bring one, parking is free at the Meadows and at the Center. Breakfast is included in your reservation at The Meadows; it is not included at the St. Regis. 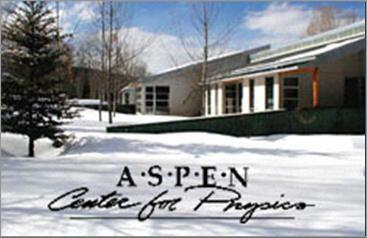 The meetings are held at the Aspen Center for Physics.